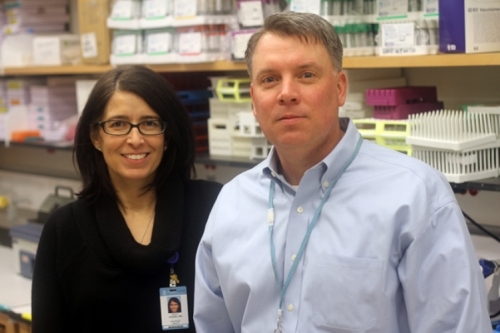 Two UNC researchers design a biological test to individualize chemotherapy. When gynecologic oncologist Paola Gehrig makes a treatment plan, she has little to go by to make sure her patient gets the best chemotherapy dose with the least amount of toxicity. For most chemotherapy drugs, the patient’s height and weight are the only factors used to determine a dose. The physician then adjusts the dose once toxicities of a drug appear: severe nausea, pain, ulcers, exhaustion, and any number of other side effects. Ovarian cancer is usually detected at a late stage when a woman’s chance of surviving beyond five years drops below 45 percent. According to Gehrig, 80 percent of women with advanced ovarian cancer will relapse, and many of those who choose to continue treatment will ultimately receive the nanoparticle drug Doxil (liposomal doxorubicin). 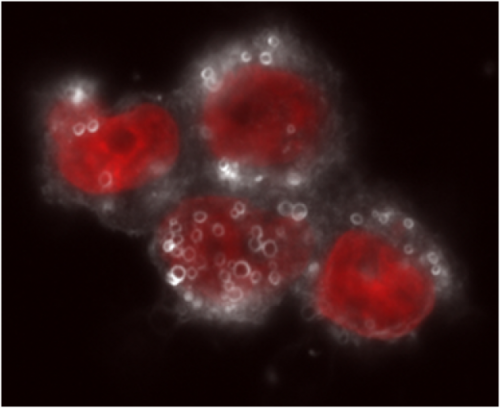 Darkfield microscopy image of cells incubated with Doxil. The Doxil particles are the small white halos, the nuclei are red, and the cytoplasm is the faint white area. Although the drug is effective, Gehrig can never tell which patients will have to stop treatment due to its painful side effects, like oral ulcers or debilitating swelling of hands and feet. So when she first saw William Zamboni’s research on Doxil during his interview at UNC in 2006, she was excited about starting a collaboration. Zamboni, a professor of pharmacy, works in a field called pharmacokinetics, which aims to describe how drugs act once they’re inside our bodies. He wants to know how long drugs stay in the bloodstream, which organs they reach, and when they are cleared from the system. His focus is nanoparticle drugs, which are drugs jammed into tiny, round packets of lipids called liposomes. The liposomes are engineered to deliver the drug to a target site, such as a tumor, so nanoparticle drugs act differently from ordinary chemotherapy drugs, and their pharmacokinetics can be much more complicated. Zamboni lost his mother to ovarian cancer, and she was diagnosed just as he began his work on Doxil at the University of Pittsburgh. “She was responding,” he says, “but we had to stop because of the toxicity accumulation.” Like Gehrig, he sees the need for improvement in nanoparticle-drug dosing. Within months of his arrival at UNC, he and Gehrig started a collaboration that has continued for six years. Their latest study may change the future of how nanoparticle drugs are administered. Zamboni’s work on Doxil revealed that its pharmacokinetics are extremely variable. He couldn’t discern a pattern to how and when the drug disappeared from the bloodstream. Zamboni knew, though, that immune cells called monocytes played a role in clearing nanoparticle drugs. Monocytes circulate in the blood and are very good at engulfing foreign particles, “kind of like Pac-Man,” he says. Zamboni decided to find out exactly how monocytes influence the way nanoparticle drugs are dispersed and cleared. His group examined the blood of cancer patients receiving a nanoparticle chemotherapy drug and discovered that patients whose monocyte numbers dropped didn’t clear the drug as well as those whose monocyte numbers were unchanged. By clearing the drug, the monocytes could be changing the exposure that patients actually get, and an oncologist, like Gehrig, would never know it. The number and activity of monocytes can differ greatly among patients, and Zamboni and Gehrig wondered if that variation is related to the variable responses to Doxil. They designed a study to measure monocyte number and function in ovarian cancer patients at UNC who were about to receive Doxil. They measured the amount of the drug present in the blood over time and found that patients who had more active monocytes did indeed clear it faster. That means that when it comes to nanoparticle drugs, some patients may be underdosed. He and Gehrig hope this test, or probe, of monocyte function could be given before each cycle of chemotherapy, giving oncologists more control over how much drug their patients are actually getting. “Giving everybody the same dose doesn’t make sense,” Zamboni says. Gehrig and Zamboni say the next step is to expand the patient population and show that the test can work in other clinical settings. A few days before beginning treatment, a patient would give an extra teaspoon of blood. In a few hours, a lab technician could perform the test to determine how well the monocytes “eat” particles added to the blood. From there, a calculation could translate the results into an optimal dose for that patient. The technology, called PhenoGLO, has been licensed to a company called Wildcat Pharmaceutical Development Center, which Zamboni helped start. Currently, Gehrig and Zamboni want to determine if PhenoGLO could predict how much toxicity a patient is likely to experience. That information would allow oncologists to adjust the dose before the side effects start, which could have major impacts for ovarian cancer patients on Doxil. Gehrig says that a patient can be faced with a difficult decision when Doxil becomes the only drug that can keep her tumors at bay but is also the cause of oral ulcers so bad that she can’t eat. “This is a real-life issue, not just here at UNC, but for women everywhere with this disease,” Gehrig says. It’s a challenge that drives both her and Zamboni and reinforces their strong collaboration. They are hopeful that their test could lead to smarter dosing, not just for Doxil, but for other nanoparticle drugs used for cancer and diseases like rheumatoid arthritis. Amanda Keener is a doctoral student in the UNC Department of Microbiology and Immunology in the School of Medicine. Paola Gehrig is a professor in the UNC Department of Obstetrics and Gynecology and a member of the Lineberger Comprehensive Cancer Center. She is also director of the UNC Division of Gynecologic Oncology. William Zamboni is an associate professor in the UNC Eshelman School of Pharmacy and UNC Lineberger Comprehensive Cancer Center. He is also directs the UNC GLP Bioanalytical Facility and the UNC Translational Oncology and Nanoparticle Drug Development Initiative Lab. Their study, "Translational studies of phenotypic probes for the mononuclear phagocyte system and liposomal pharmacology," was published in the Journal of Pharmacology and Experimental Therapeutics in December 2013. The work was funded by the NIH National Cancer Institute, the NIH National Institute of Environmental Health Sciences, and the University Cancer Research Fund from Lineberger and the North Carolina Translational and Clinical Sciences Institute.